A powerful and antioxidant-rich serum designed for dull, lacklustre skin. Developed to enhance the skin’s hydration and elasticity, Pycnogenol 5% is ideal for promoting a smooth, rejuvenated complexion. 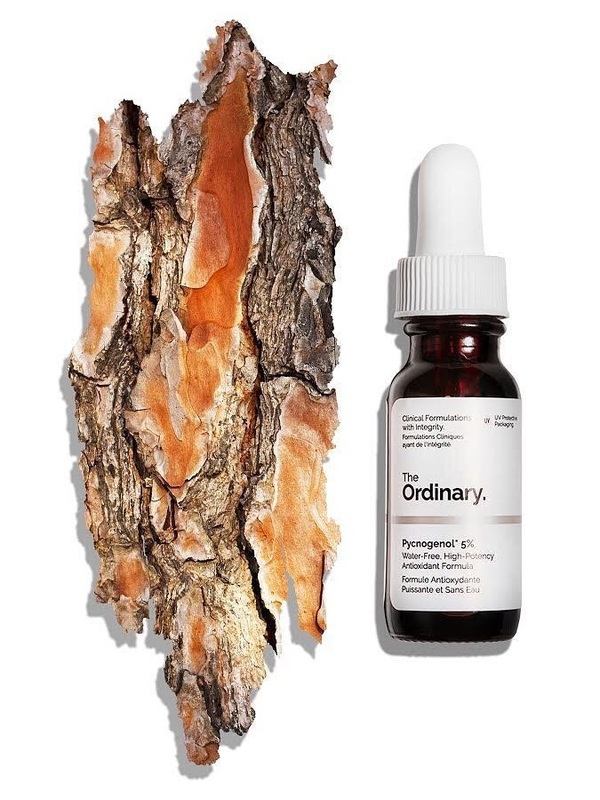 This powerful formula uses Pycnogenol, a plant-derived antioxidant to nourish the skin from the inside out, targeting free radicals before they cause damage and restoring Vitamin C activity. Apply alone or mix with other treatments for visibly radiant results. Pycnogenol – Derived from the bark of French pine trees, this potent extract binds to collagen and elastin to revitalise the skin. Apply alone or after water-based serums, before oils or heavier creams. Alternatively, mix with other treatments to enhance their antioxidant capacity. Wash hands after application and avoid product contact with fabric as it may stain. How Pycnogenol® helps from both inside and out? Pycnogenol® French maritime pine bark extract is widely used in topical and oral applications for various dermatological indications. 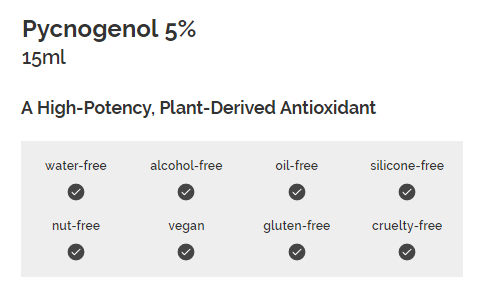 A unique combination of pharmacological functions of Pycnogenol® provides an unmatched variety of health benefits for skin health. 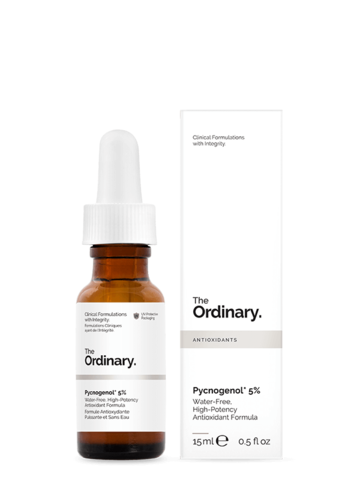 Pycnogenol® binds with skin proteins collagen and elastin, and protects skin from various harmful enzymes helping to rebuild elasticity, essential for a smooth, younger look. Pycnogenol® helps promote the «glow» and reduce over-pigmentation for a more even complexion (brown spots). Sunburn is an inflammation caused by free radical induced tissue damage. By neutralizing these free radicals, Pycnogenol® helps protect skin from the stress and damage of sunburn and photoaging. Several clinical studies have shown that Pycnogenol® protects the collagen matrix and increases skin stability during healing. Pycnogenol® has a high affinity to the amino acid hydroxy-proline, which is present exclusively in matrix proteins collagen and elastin. In consequence, Pycnogenol® (and also its metabolites) protects these proteins from free radical damage and enzymatic degradation. Pycnogenol® enhances generation of endothelial nitric oxide (NO) which is the key mediator facilitating arterial relaxation and consequently allows for optimal blood flow. 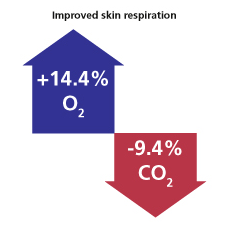 Taken orally, Pycnogenol® was found to increase blood perfusion of the skin and oxygen partial pressure increased and, conversely, carbon dioxide concentration decreased. This study demonstrated an improved healing of wounds (ulcers) in individuals with micro-circulatory disorders. An improved blood perfusion of the skin warrants optimal supply with all important nutrients as well as better hydration to support skin vitality. Pycnogenol is another name for the extract of French maritime pine bark. It’s used as a natural supplement for several conditions, including dry skin and ADHD. Pycnogenol contains active ingredients that can also be found in peanut skin, grape seed, and witch hazel bark. Pycnogenol provides many benefits to the skin, including reducing the signs of aging. A small 2012 study on postmenopausal women found that pycnogenol improved hydration and elasticity of skin. Study participants took pycnogenol as a supplement, and it was found to be most effective in women who started out with dry skin. The researchers concluded that pycnogenol may increase production of hyaluronic acid and collagen, which are both found in many popular antiaging products. A 2004 animal study also found that applying a gel containing pycnogenol sped up the wound-healing process. It also reduced the size of scars. A 2017 review reported on the many benefits of using pycnogenol to reduce the effects of aging on skin. Pycnogenol appears to reduce the creation of free radicals, which are molecules linked to several skin conditions. It also seems to help with cell regeneration and replication.